GCA's client Vector Capital successfully closed its fifth technology-focused private equity fund at $1.4 billion, exceeding its original $1.2 billion target. 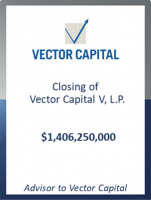 With the closing of Vector Capital V, L.P., Vector Capital's total capital under management is $3.3 billion across its private equity and credit businesses. Vector Capital V, L.P. will continue Vector’s 20-year history of investing in public and private technology companies across software, internet and digital media, communications, and industrial technology. Vector Capital is a leading global private equity firm specializing in transformational investments in established technology businesses. Vector identifies and pursues these investments in both the private and public markets. Vector actively partners with management teams to devise and execute new financial and business strategies that materially improve the competitive standing of these businesses and enhance their value for employees, customers, and shareholders. Among Vector's notable investments are 20-20 Technologies, Aladdin Knowledge Systems, Allegro Development, Cambium Networks, Certara, ChyronHego, CollabNet, Corel, Emarsys, Gerber Technology, IPVALUE Management, LANDesk Software, Niku, RAE Systems, Register.com, Saba Software, SafeNet, Sizmek, Technicolor, Teletrac, Tidel, Triton Digital, and WatchGuard Technologies. GCA served as an advisor and placement agent to Vector Capital in connection with this fundraise.